Designs lovers the world over have descended on Milan for the hottest design date of the year. Preciosa Lighting has brought Joy, Life & Light to Milan Design Week and it is spectacular. Happiness and laughter is all around as visitors discover Carousel of Light. Won’t you take a ride on our Carousel of Light? Enter the pearl curtain, our colourful lights will lead your path. As you wander through, the lights above light up, fading away as you move on. The installation becomes a part of the vistor’s journey, lighting a beautiful crystal path as their exploration continues. To make it easier for people to absorb themselves in the spectacle, the platform rotates, allowing guests to keep their eyes focused on the pearls. 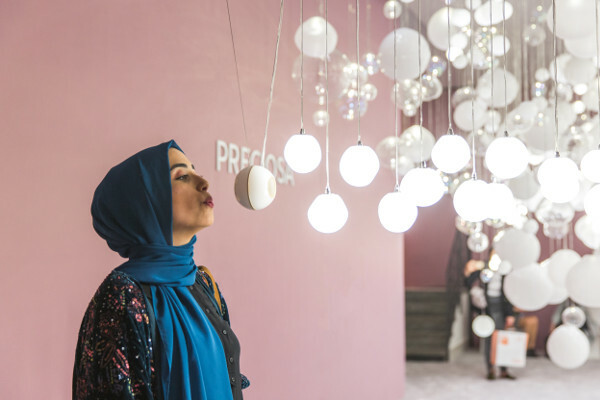 Visitors to Preciosa’s exhibition in Milan last year will happily remember Breath of Light. Experience it once again, or take advantage of this repeat performance. Breath of Light takes illumination interactivity to a whole new level. Visitors are integral to the exhibition, becoming a part of it with every breath they share. The installation is made from a series of opal crystal bubbles that dissolve into crystal frosted, crystal clear and bubbled crystal spheres. These bubbles create an intriguing path of light as visitors blow into four special sensors hanging on the corners of the exhibition. Pearl Wave’s flow is reminiscent of sea waves, and its curving form, the shape of a seashell. Artists have always looked to nature for inspiration and the mysterious depths of the sea simply swell with possibilities. Pearl Wave is made from more than 700 handmade triplex opal spheres, suspended on gold finished metal rods. 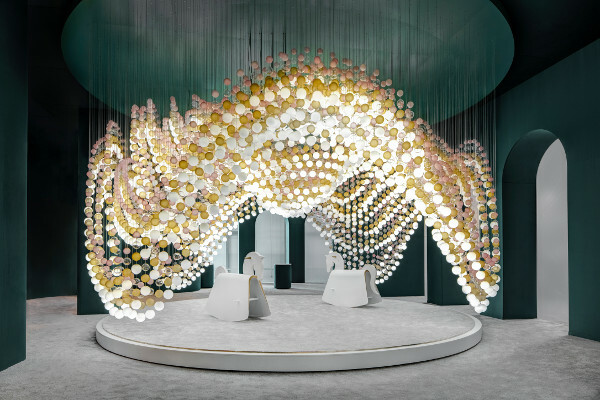 The playful chandelier reacts to the happiness surrounding it; when glasses are cheered in a toast, Pearl Wave responds with a burst, or two, of light. The simple act of clinking glasses brings the chandelier to life. Preciosa is showcasing a selection from our Collections line, featuring both chandeliers and solitaires. 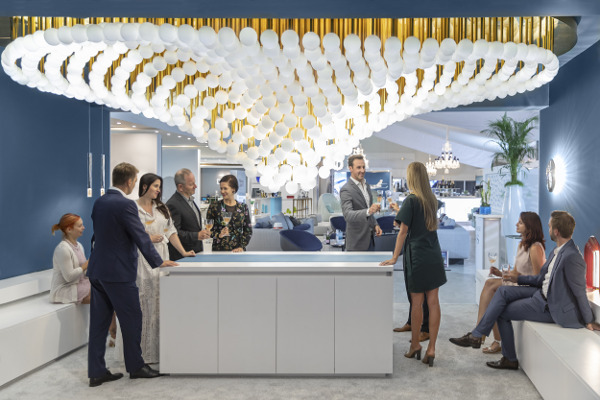 For Euroluce 2019, we are pleased to announce a new addition to the Siren solitare family. The Siren table lamp is a colourful and quirky light, a functional conversation starter perfect for contemporary living rooms, by the bedside, or in the entryway. 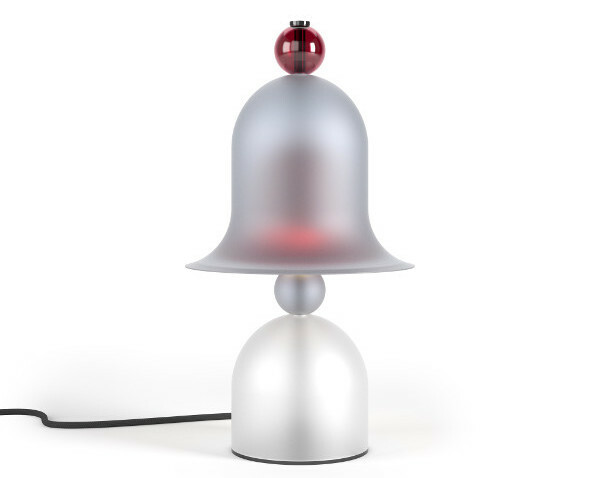 Also on display are the chandeliers Eugene and Rudolf and the solitaries, Flare, Siren, Gemma and Geometric. Each one demonstrates Preciosa’s commitment to tradition with an eye to the modern interior.